We are committed to conducting healthy business practices which support our company values of respect, honesty, integrity and accountability, creating a positive working environment. We believe in empowering people, building relationships and improving lives. Entrepreneurship, incentivisation, decentralised management and ongoing two-way communication are the key elements in our recipe for success. We subscribe to a philosophy of excellence, accountability, integrity, transparency and innovation in all our interactions. 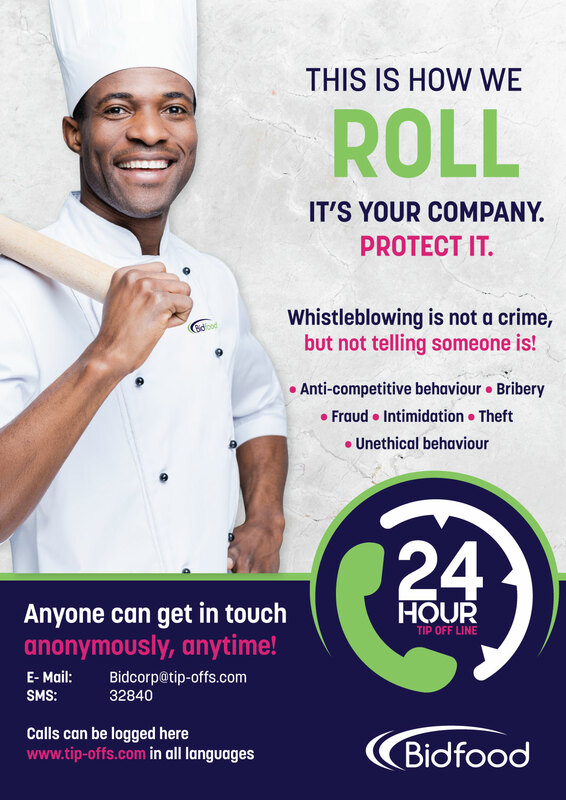 Bidcorp has invested in an independently globally accessible anonymous tip-offs line. The service is operated by Deloitte and is completely independent of all Bidcorp’s global operations. All contact made will be dealt with and reported in total anonymity, without fear of discrimination of any kind. Your identity will be protected, unless you request otherwise. The law also provides protection in the form of The Protected Disclosures Act which protects you from being victimised, harassed or dismissed for "blowing-the-whistle" on wrongdoing in the workplace. Anyone can contact the tip-offs line 24 hours a day, 365 days a year, in the language of your choice!